The University of South Dakota gave the best showing this sumer at ROTC Warrior Forge, according to this AP report. 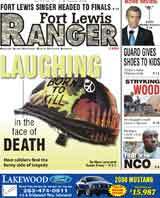 Living With Style has a guide to becoming a military officer – Fort Lewis is mentioned. A California woman posed as a freshman at Stanford and took real ROTC classes at Santa Clara. Bob Rosenburgh, PAO of the Western Region at Fort Lewis comments in this San Francisco Chronicle story. The Daily at the University of Washington has a story on the ROTC program there with mentions of training at Fort Lewis. The Western ROTC Region headquartered at Fort Lewis handed out its top award to the University of Utah, as reported by the Deseret News. (Progress-Index) – The three-week stay is part of voluntary follow-up training after attending their Leaders Development and Assessment Course at Fort Lewis, Wash.